One of the great perks of my job is working with people who know a lot more than I do. On June 19th we presented the latest in the TeaSource Tea Masters workshops featuring Chaminda Jayawardana, the managing director of Lumbini Tea Factory, Deniyaya, Sri Lanka. 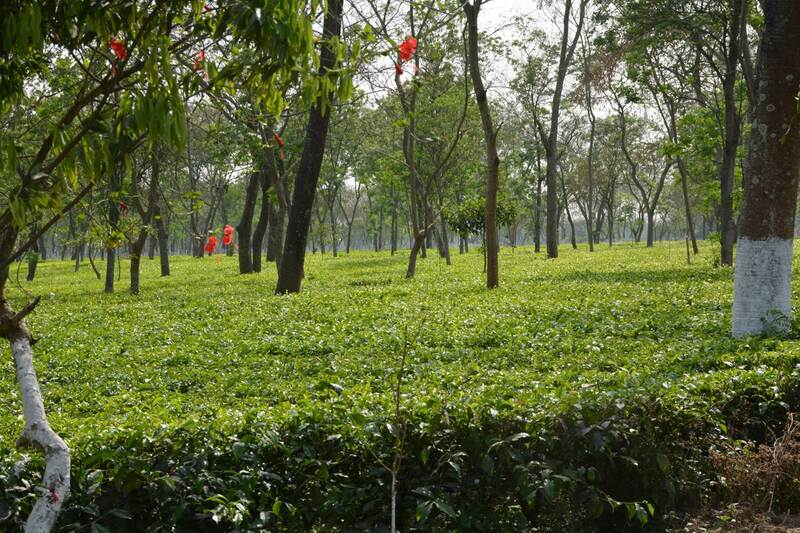 Lumbini is one of the most awarded tea gardens/factories on Sri Lanka. Chaminda and I had an absolute great time working together—and once again I came out of these workshops learning far more than I knew going in. But before the workshop we had to stop and get some tea; at TeaSource in St Anthony, MN. Chaminda was traveling with his close friend, colleague, neighbor, and direct competitor Dissanayake Mudiyanselage Harris Ukkika Mahadiulwewa (henceforth referred to as “Harris”). One of the many things I love about the tea business is that competitors can be close friends; and neither the business nor the friendship has to suffer. That’s me on the left, Harris in the middle, and Chaminda on the right. Chaminda and Harris had never tried high quality Taiwanese Jade oolongs before, so we indulged with some Tung Ting Light Roast Oolong. Ringing Chaminda up at the St Anthony TeaSource. He saw tea paraphernalia he had never seen before, and yes, I gave him a discount. Me, Chaminda, and Harris at St Anthony. Harris was impressed when he saw wooden tea chests from Lumbini (and other tea gardens) throughout the store. And I got to play tour guide, taking Chaminda and Harris for a walk along the Mississippi, exploring Minnehaha Falls, visiting the Stone Arch Bridge Festival and Lake Calhoun in Minneapolis (we do have 10,000 lakes after all), and ending up at Guitar Center in Roseville, they don’t’ have Guitar Center stores in Deniyaya, Sri Lanka and Chaminda is a musician in addition to being a tea master. Back at the TeaSource warehouse in Roseville. In preparation for the 50 people coming in for the workshop, we scavenged every chair and table throughout the building and arranged them in the open warehouse space for participants—which meant that we had nothing left in our offices/cupping room etc. Chaminda had brought 2 new samples of tea he wanted me to try. 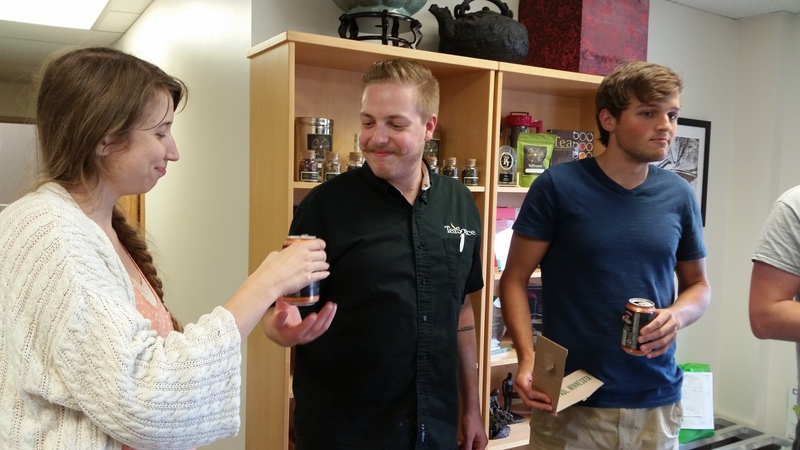 So rather than cupping them up in our cupping room (which at that point was just an empty space with no chairs or tables), we decided to sample and evaluate these teas on the customer ledge by our office administrator’s desk. We were sampling two Lumbini samples of grade OP1 grade Ceylon black tea, for some blending we will be doing later this year. The warehouse tour for workshop participants. It always surprises me how many people want a tour of our work space. Chaminda and I start talking about tea. Chaminda’s role was to be the expert and to make sure everyone (including me) walked out knowing a lot more about growing Ceylon tea, than we knew coming in. My role was mostly comic relief and amazement at the tea-maker’s craft. We had a lot of fun together. 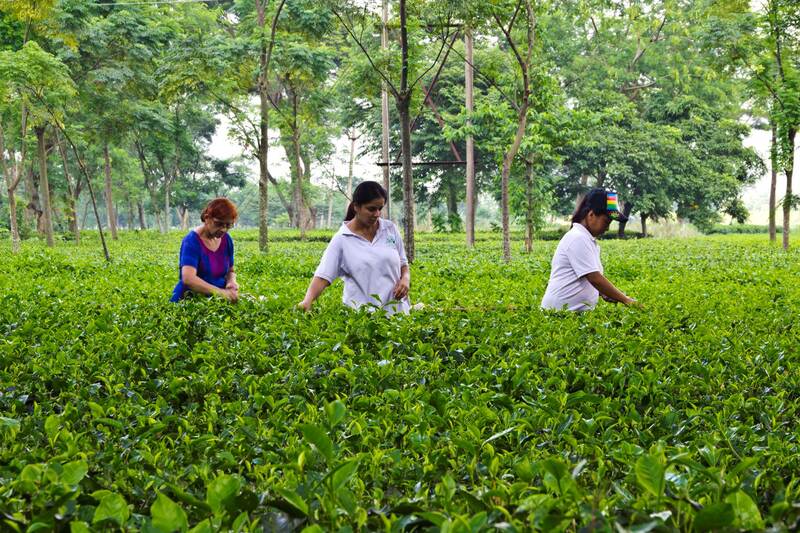 Lumbini Estate (and all Ceylon tea gardens) had only dealt with tea brokers until I convinced Chaminda to bypass brokers and sell directly to wholesale customers. Chaminda and Lumbini now sell direct to more than 15 countries across the world. TeaSource was first. This Lumbini Silver Needles is the first tea I bought from Chaminda. I brought back 2 gigantic duffle bags stuffed with this tea when I flew back from my first visit to Lumbini. To me the most amazing part of this tea is the fact that Chaminda had never heard of Chinese Yin Zhen (Chinese Silver Needle white tea), when he created his own Silver Needles. The TeaSource infographic on Ceylon and Ceylon teas. It shows all the major growing regions, and Lumbini Tea Factory. I took a couple of minutes to read from my great grandfather’s memoir. He was in Ceylon in the 1860’s and 1870’s helping establish the first tea gardens. 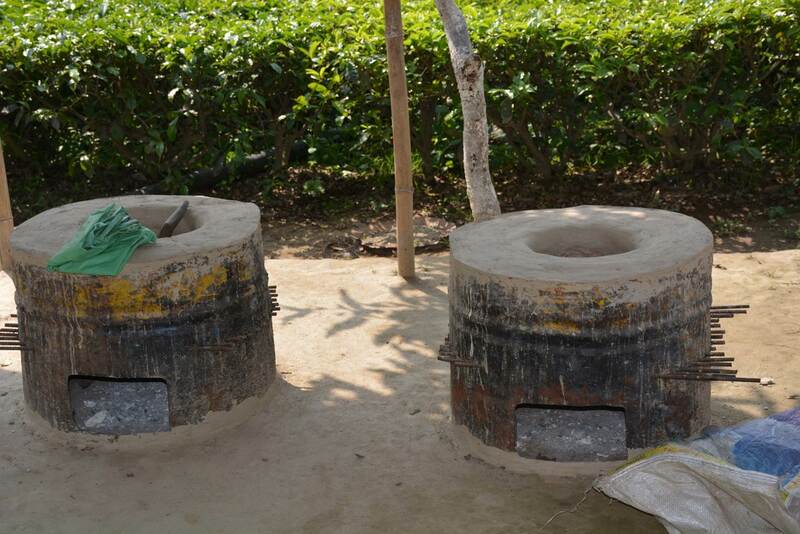 “I will mention here a few things a young tea planter should learn as soon as possible. First and foremost he must learn to speak to the coolies in their own language - the Tamil. He must learn how to make nurseries from seed or cutting, how to prune and care for the crops, drain and make roads in the new plantation. He must also learn to design and superintend the building, whether in wattle and dab for the coolies’ “huts” or in brick and stone for his own building. He must learn something of sickness and the simple medicines to give. He should, by all means, know enough to sew a button, in an extremity …. Chaminda examining the leaf, and explaining the detail of why Lumbini teas are so special and have won so many awards. They are all hand-plucked and orthodox processed, i.e. minimal use of machines during processing. It is so much fun to listen to someone who is expert and passionate about their field. Everyone sampled six Ceylon different teas (and went home with a couple of more). One of the amazing things about Ceylon teas is that while it is a small island: the diversity of tea styles, flavors, is huge. “Stick your nose in the cup.” During workshops I say that a lot. Tea is as much an olfactory experience as it is a taste experience. 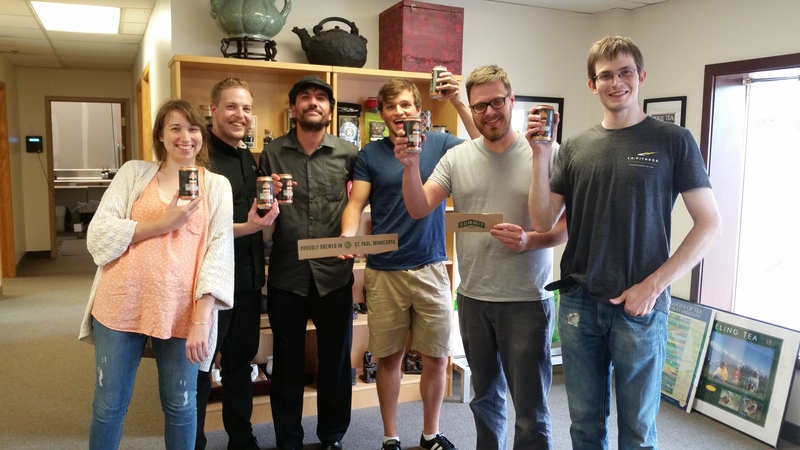 The community of Twin Cities tea enthusiasts has grown quite large and is …. well …. enthusiastic. And it is a whole lot of fun when we all get together and sample and talk teas. And of course, since this was a celebration (of Ceylon teas) everyone had to walk home with some swag bags. Me, autographing a Ceylon tea poster—that was a little unusual, but wisely the participant had asked for Chaminda’s autograph first. Chaminda and one of the many appreciative attendees. People did seem to have a great time. Good tea makes good friends. 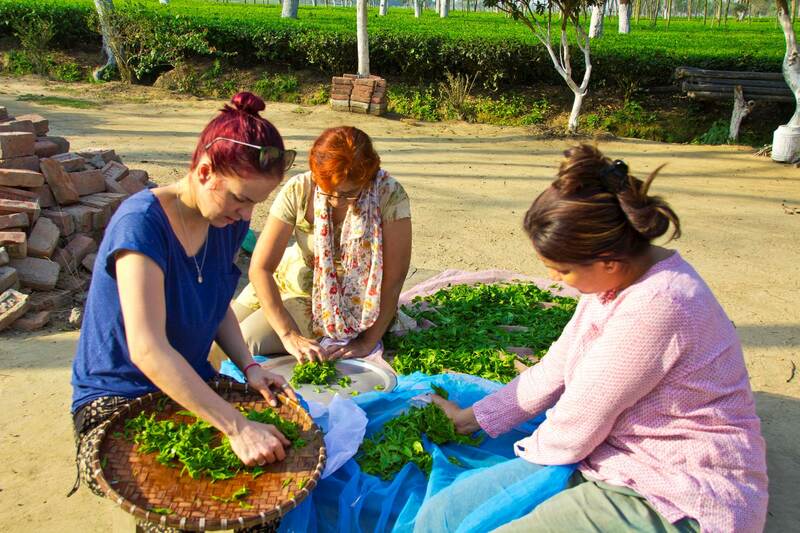 Lumbini is some of the best tea, so it’s not surprising it has led to one of the best friendships. Next came the day for the final brew to be canned. We were there for that too. 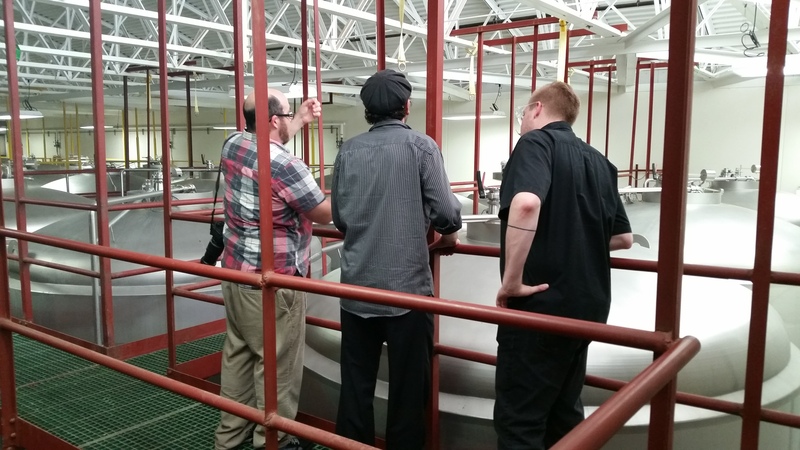 Brewers had to balance themselves and the Earl Grey tea over these tanks while adding them to the beer scoop by scoop through a small opening. 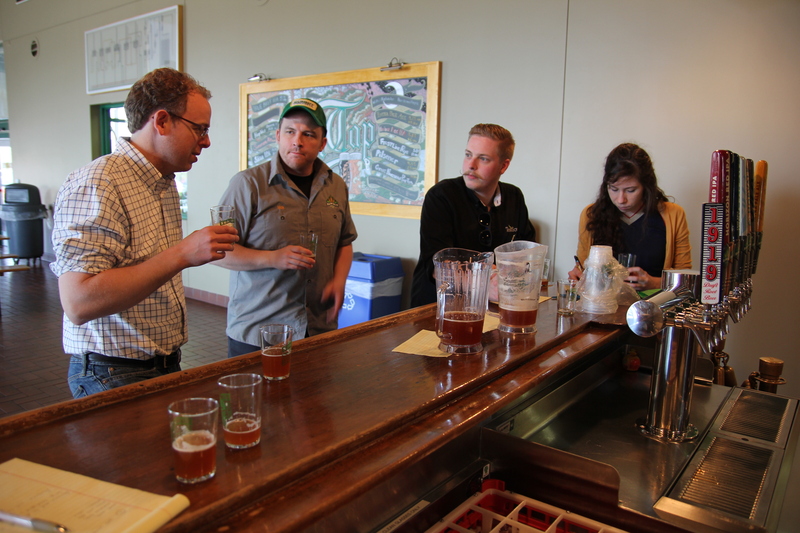 Summit sent some Make It So with us as we left their brewery, which we brought back to our offices to taste and celebrate with our co-workers. 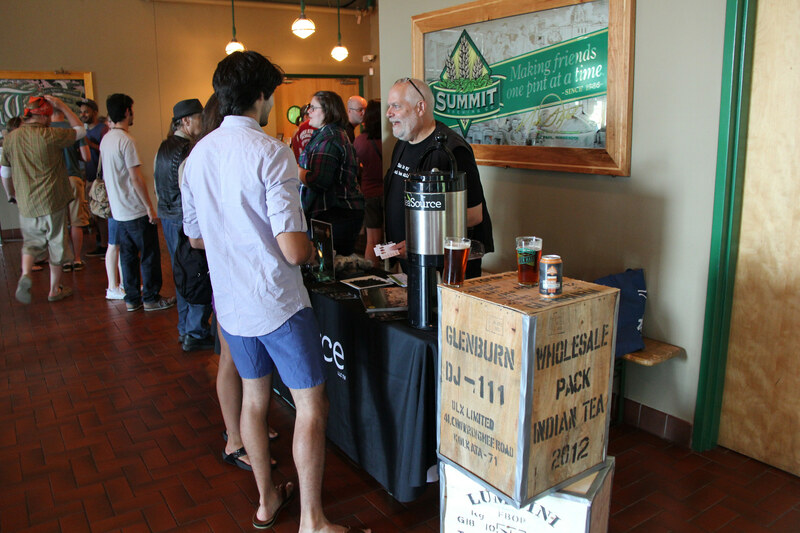 Now, Summit and TeaSource have teaming up for some samplings this month at area liquor stores. We are playing carnival games and giving away prizes in celebration of Make It So and Canned Beer Month! We hope you join us. 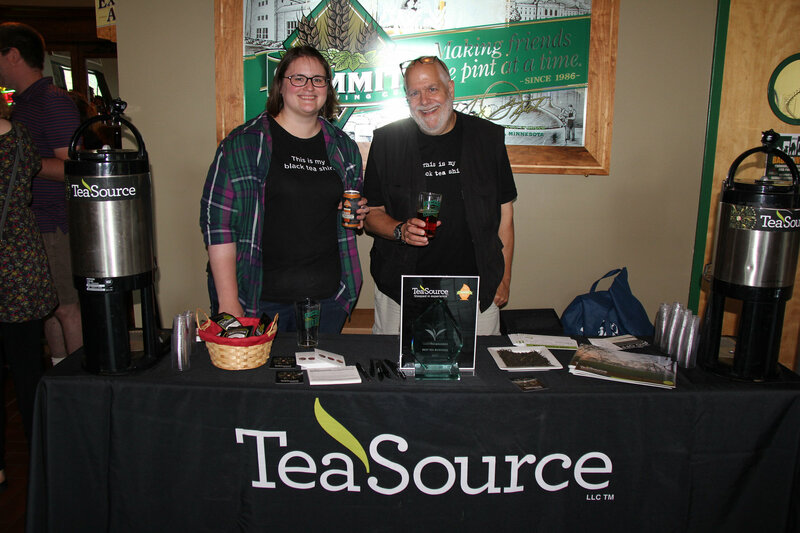 All of this talk about tea and beer inspired former TeaSource manager, Jess, to share her experience with homebrewing beer with tea. Before her move to Portland, Jess wrote a quick explanation about using tea in her brews for Beyond the Leaf. 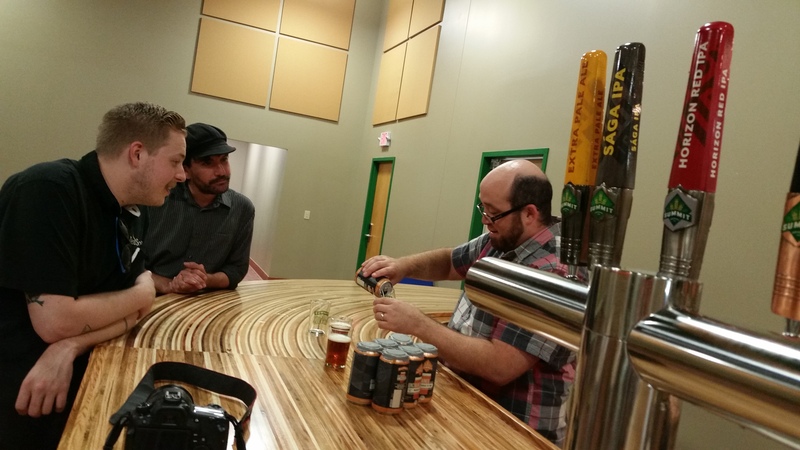 She also sat down with Chip Walton of Chop & Brew to record an episode for his web series on homebrewing. 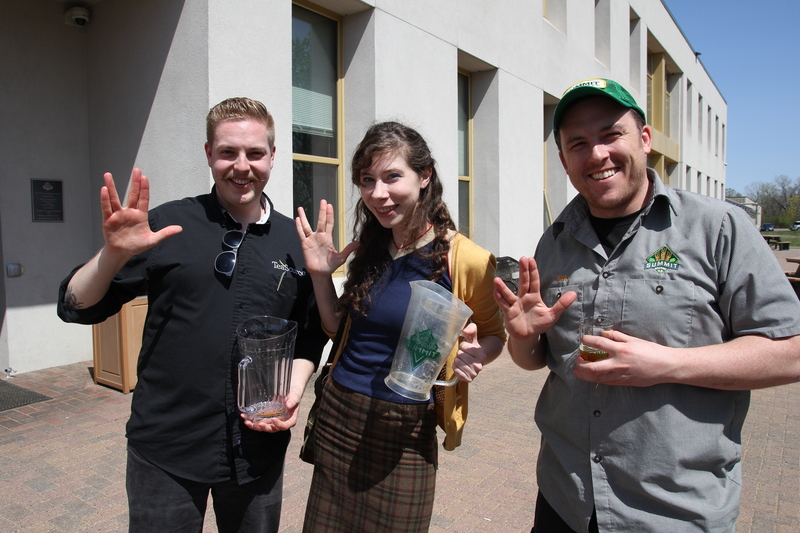 We had a lot of fun with Summit Brewing Company and Chop and Brew and look forward to future collaborations! 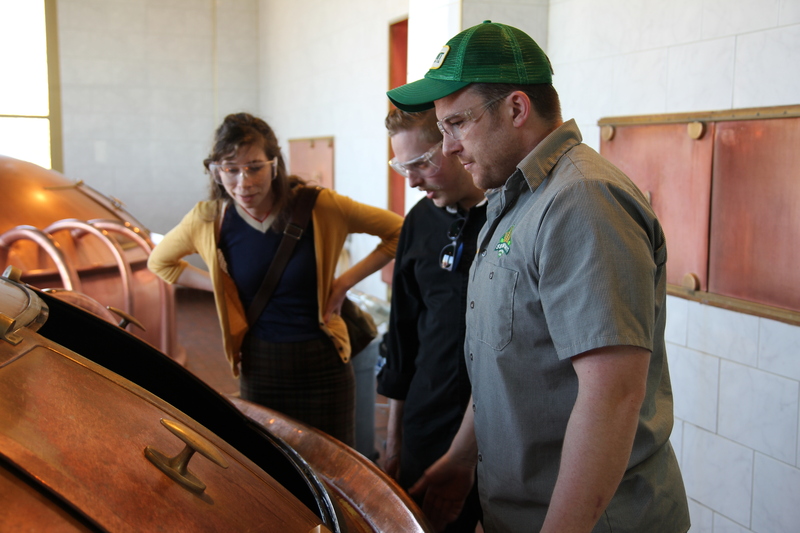 Water, Malt, Hops, Yeast…and tea? 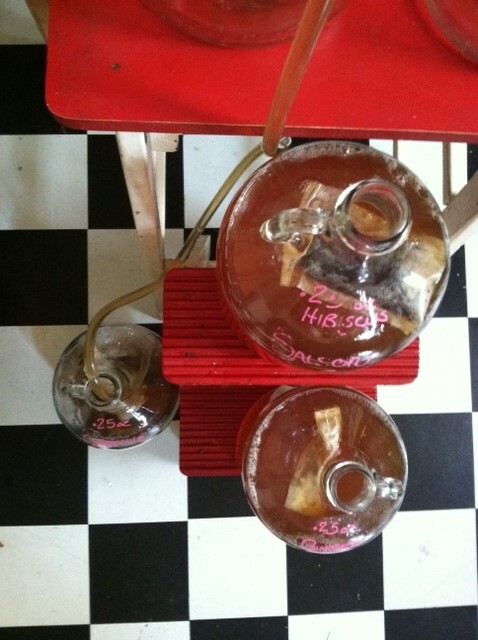 Have you made your first batch of homebrewed beer yet? If not, I bet you know someone who has. Homebrews are bubbling in many kitchens these days, and brewers are going way beyond the traditional ingredients. There’s nothing wrong with being a teetotaler, but if you are like me, you sometimes prefer a cold beer over an iced tea on a summer afternoon. Fortunately, you don’t have to choose. Tea and beer - together at last. I started homebrewing five years ago- the same year I started working at the Highland Park TeaSource. It didn’t take long to start applying what I was learning for a living to what I was brewing in the basement. 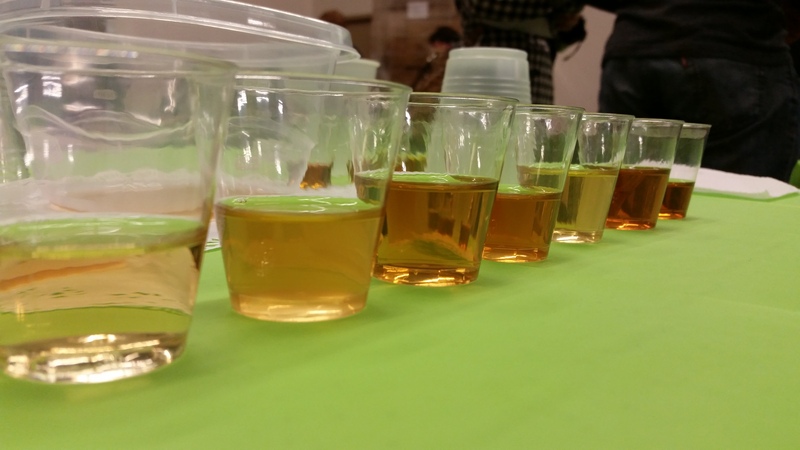 What follows are three basic methods for applying tea to your homebrew. I’ve also added a list of my most successful experiments and a few ideas I haven’t gotten around to trying yet. The specifics may not make much sense if you’re not brewing yet, but get yourself a basic home brew kit (Northern Brewer is a great place to start) and soon you’ll be making delightfully quaffable tea-beers (and tea-ciders and tea-meads). The most subtle way to apply tea to your beer is to substitute tea for your aromatic hops. These hops are added in the last 5-10 minutes of the boil. They add a lot to the nose but are pretty subtle in the sip. Tea has an intense aroma so a little can go a long way. 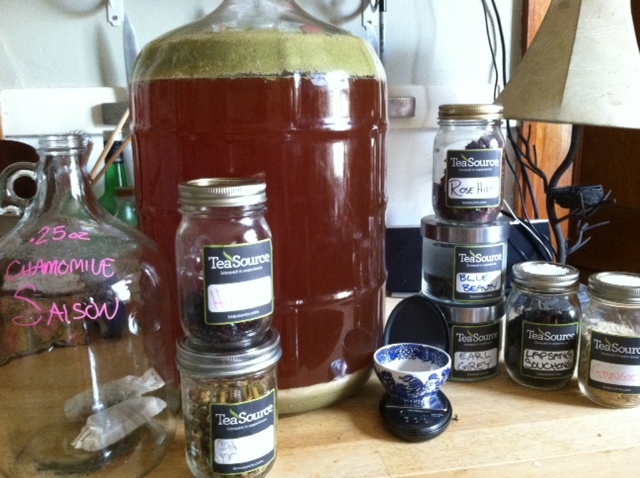 I typically use one ounce of tea in the last five minutes of the boil, (5 gal. batch) unless I’m making an IPA and then use 2 ounces. 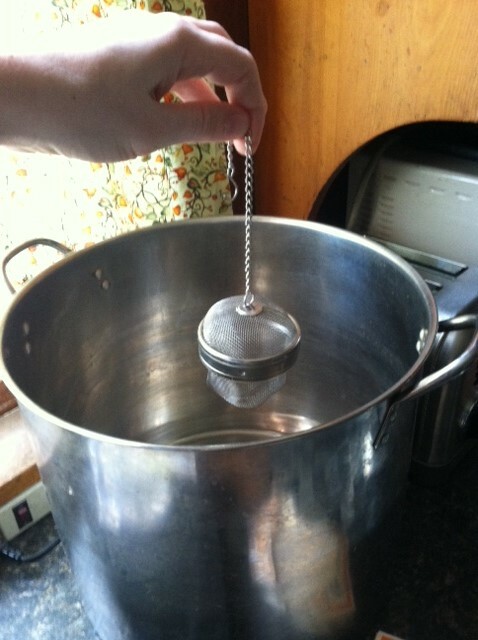 You can put the tea in a large infuser tea ball or in a large #4 size T-sac. I find this method works best with straight black teas. 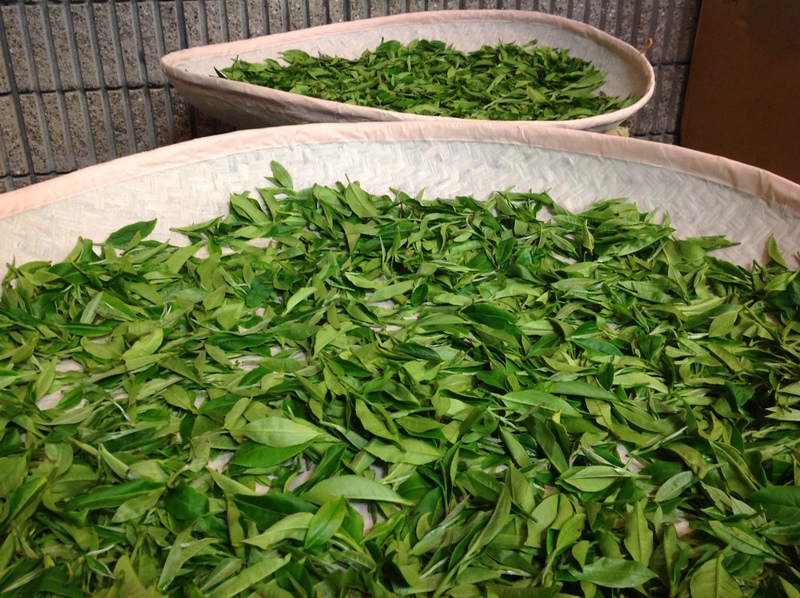 Green and white teas are quickly overwhelmed by the beer and any hops you may be using. If you’re not sure what black tea to add to your beer, these basic flavor profiles will give you a place to start. Darjeeling- Crisp and slightly astringent. Subtle fruit notes. Great for IPAs. Ceylon- Brisk, medium-bodied tea from Sri Lanka, good for pale ales or IPAs. Yunnan- Medium-bodied woodsie Chinese black, awesome in Belgian beers. Keemun- Rich and earthy Chinese black tea. Great for porters & scotch ales. Assam- Very strong and malty Indian black tea. Perfect for stouts. My favorite way to add tea to beer is to add it to the carboy after the initial fermentation has slowed down or when the beer is moved to the secondary fermenter. This method works great for both straight and flavored teas, both black and green teas, and everything in-between. Just put an ounce or so of tea per 3-5 gallons beer. I find the #4 T-sac works really well here because the t-sac weave is finer than the cloth steeping bags you buy at homebrew stores. Only fill the T-sac a third full to allow the leaves to expand and release their flavor. You can use multiple t-sacs, just staple the top closed. They will typically float on the top of the beer slowly oozing flavor. I like to keep them in for at least a week or two, then taste the beer and take the t-sacs out if the flavor is strong enough. This method will typically give your beer a smooth and strong tea flavor. 3) Add Tea as a Concentrate at Bottling The final method I have tried when adding tea to beer is to make a concentrate of tea and add it to the bottling bucket with the priming sugar before you bottle your creation. This works especially well for flavored teas, but it can be used for straight teas too. 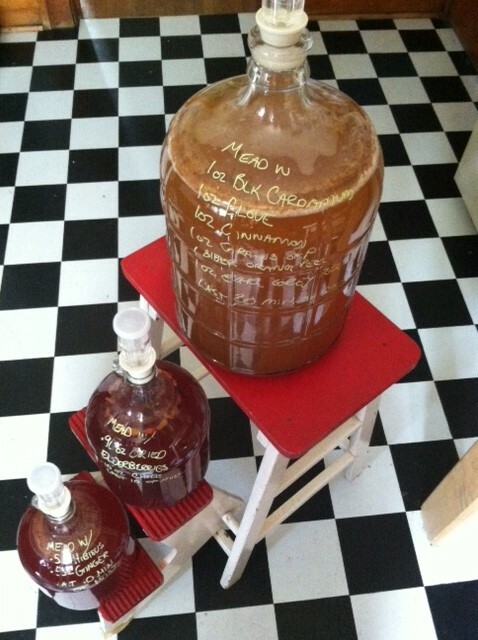 Use an ounce of tea for 3-5 gallons of beer. Steep this ounce of tea in about 2 cups of water. Use the water temperature and steep time that is recommended on the tea package. That’s it! If you have questions or comments- or just want to chat about home brewing with tea- I can be reached at our Eden Prairie store. edenprairie@teasource.com Make It So! And here's a bit of fun - Summit Brewing's brewer Nick Hempfer developed a new beer in their Unchained Series that will feature TeaSource's Earl Grey White Tip! 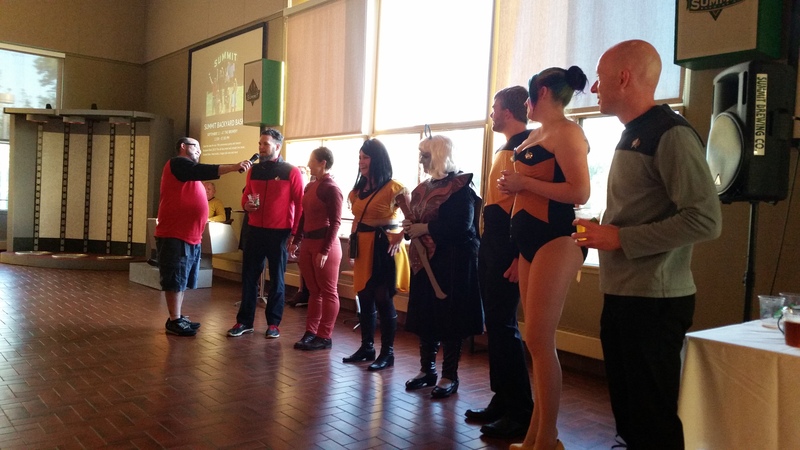 Some of us had an opportunity to try their pilot batches - you can read more about the inspiration behind this beer (Star Trek! 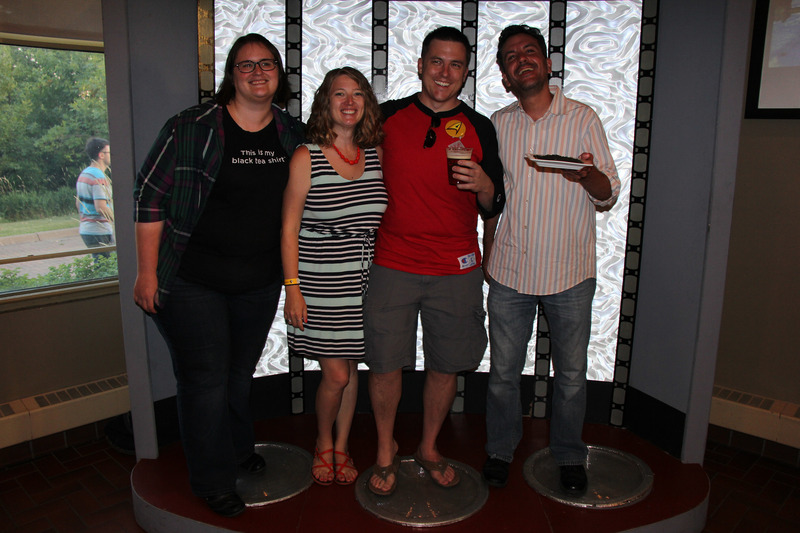 ), tasting notes, and our visit to Summit on Summit's blog. Finally, below is my personal list - beers I've brewed and beers I would like to try. 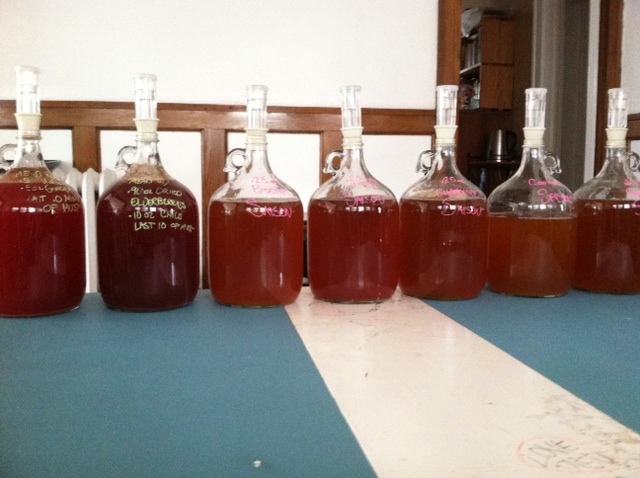 Ginger/Hibiscus Petite Saison- made 2012/2013/2014/ and 2015- Favorite! We are pretty comfortable being called tea geeks. I’ve been serious about tea for around 35 years and TeaSource is nearing its twentieth birthday. We recently spent a week at the World Tea Expo (the WTE is the world’s largest international specialty tea exposition-for the industry, not open to the public). At this year’s WTE I was teaching (or co-teaching) five classes/workshops. Sharing knowledge is a fundamental value of TeaSource. It is what many older (and wiser) tea men did with me over the last 35 years, and that is a major reason TeaSource has had some success. So I try to share knowledge with others: customers and new folks coming into the industry. 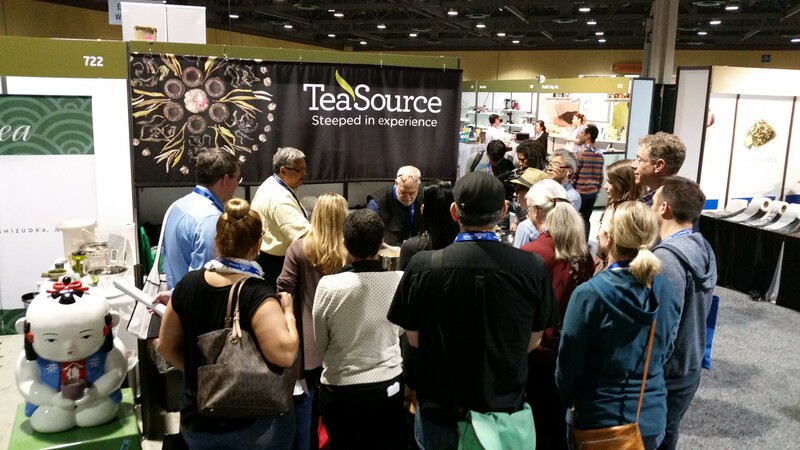 At the WTE, I started by teaching a class to 70 folks wanting to get into the specialty tea business. I had the good fortune to teach a tea tasting workshop with Rajiv Gupta on Darjeeling teas (see previous post). This workshop was especially rewarding because the class was composed of other tea professionals. 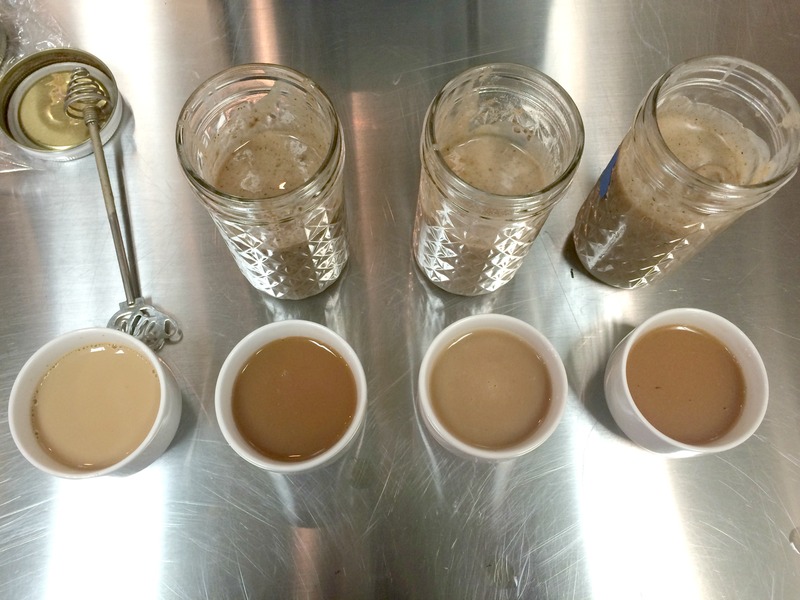 I also did two demonstrations and tastings of Indian Milk Tea: what it is and how to make it. This was great fun. Since Indian milk tea is pretty much an everyman tea in India, most of the hundreds of people attending the WTE (except the Indians) had never heard of it (we tea geeks tend to focus on the fancier teas). We had a great time doing it and it was wonderful hearing so many people go “Yum!” Then we did a 2 day class on tea processing; where we fly in next-day-air, fresh tea leaves from Hawaii, and proceed to make black tea, 2 types of oolong tea, 2 types of green tea, and white tea. And every one of them turned out nice. And at our booth, we had the opportunity to re-connect with lots of long-time (and some new) suppliers and customers. A lot of hugging going on. Up to this point it was a typical WTE for TeaSource. 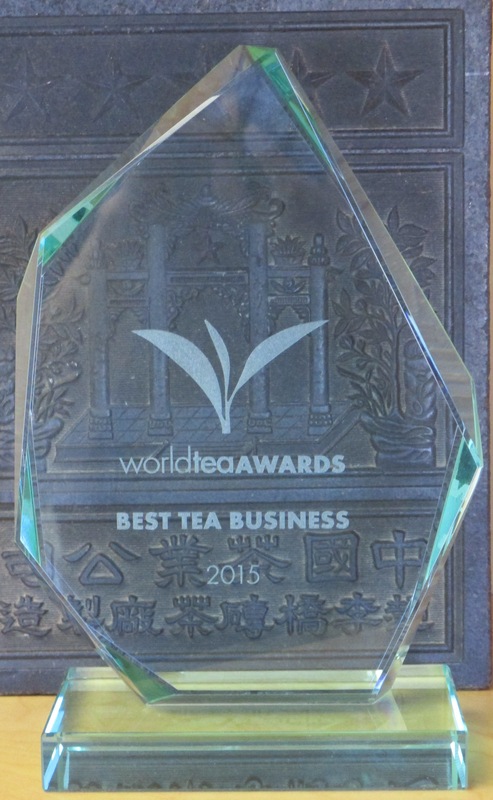 And then TeaSource was awarded the first ever “BEST TEA BUSINESS” award by vote of the attendees and the exhibitors of the World Tea Expo, ie. our industry peers. To say I was unprepared for this would be an understatement. I’m very humbled by this recognition. And I’m convinced that the main reason we received this award is because of our wonderful customers (both wholesale and retail), our incredible employees, our amazing suppliers (the men and women who grow and make our tea), and ultimately the men and women who have taught and inspired me over the last 35 years. I thank you all from the bottom of my heart. Our homemade chai is one of my favorite beverages. Ever. Since we make two gallons of it at each store every day, it seems to be one of yours too. It’s the perfect cold weather drink -- sweet and spicy with a thick creaminess. Delish. However, many customers can’t have dairy -- therefore, no TeaSource Chai (so sad). Recently we received an email requesting a non-dairy chai solution. So I’ve come up with some possible solutions for those chai-deprived souls. It would be great if it was as easy as using your favorite non-dairy milk, but the consistency of the milk is so important. First of all, it gives the final cup a creamy thickness. Secondly, it helps evenly disperse the spices. We can’t mix the spices straight into milk because they would sink to the bottom. So, I needed to thicken some non-dairy milk. Bill Waddington, owner of TeaSource (and lactose intolerant) suggested using almond milk. 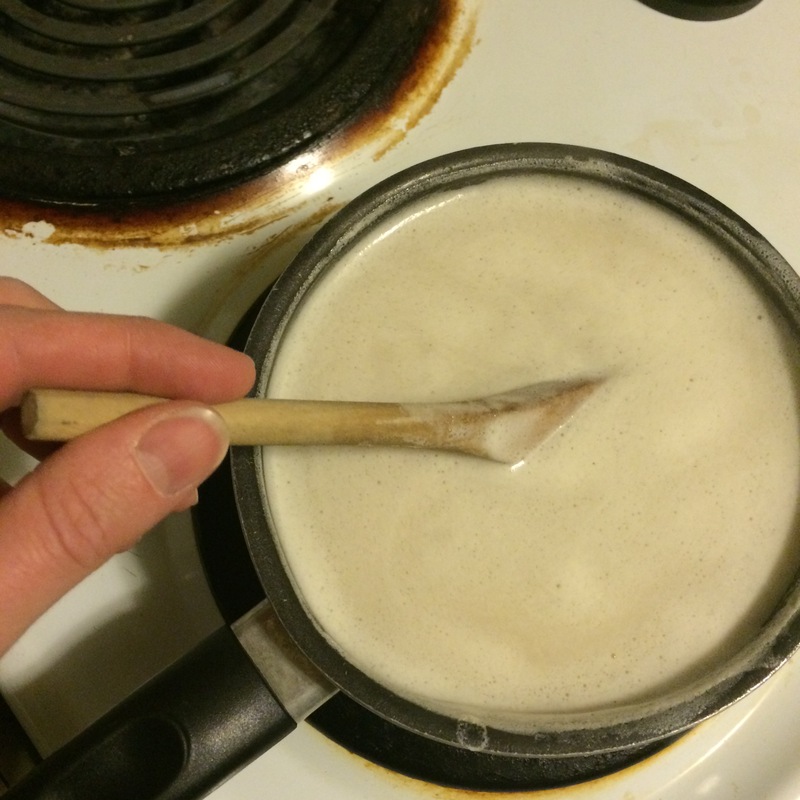 I made a sweetened condensed milk (see recipe below) by adding sugar and reducing it on the stove. After it cooled, I added a tablespoon of spices and stored it in the fridge overnight. Another popular non-dairy substitution for sweetened condensed milk is Cream of Coconut, which is usually used in alcoholic drinks like Pina Coladas; it’s naturally very thick and sweet. I added a tablespoon of spice mix to 1 cup of cream of coconut and refrigerated it overnight. You can also use coconut milk. It’s already pretty thick, so I sweetened it up with ¼ cup of honey and reduced it to 1 cup. Then, I added 1 tablespoon of chai spice followed by a night in the refrigerator. 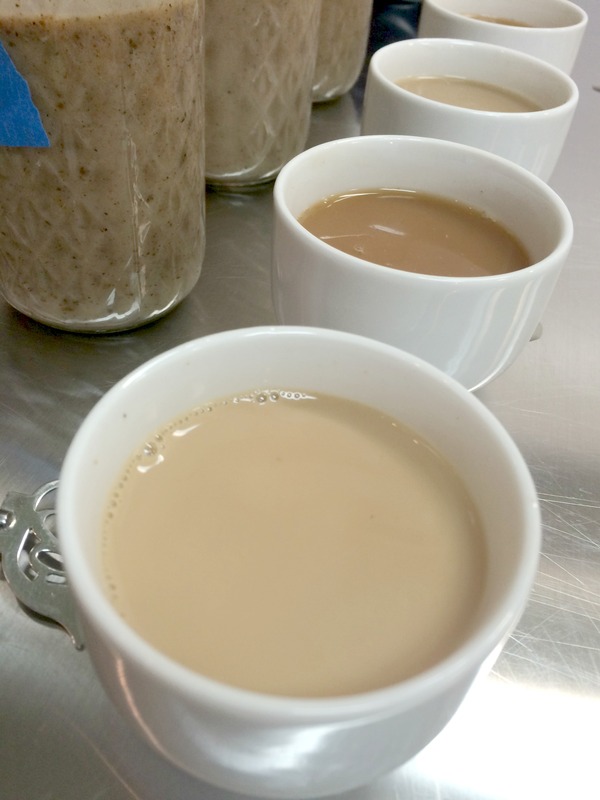 The next morning, I took my mason jars of chai goop into our St. Anthony store and steeped up some Breakfast Assam as the base for my chai experiments. Let me pause for just a minute and say this: none of these non-dairy solutions will have the same taste and feel as the original dairy TeaSource Chai. It can’t be the same because we can’t use the same ingredients. So, from here on, let’s try not to compare it to the original. 1) Sweetened Condensed Coconut Milk (made with honey) – I had the most hope for this since it was a naturally thicker milk while still tasting and looking creamy. The reduced milk also had the closest consistency to the dairy sweetened condensed milk. It was creamy and sweet, but the least spicy of them all. 2) Sweetened Condensed Almond Milk (made with sugar) – This one was the first one I tried, and at first it felt thin. But after sampling it and the others multiple times, it grew on me. It was the spiciest and the creamiest of the three. 3) Cream of Coconut – I was so nervous about this one because of the strong coconut smell. However, I was really surprised with how well it cupped. It was creamy and spicy. This one had the closest mouthfeel to the original chai (oops, we’re trying not to compare to the original). Of the three, this one was the sweetest with a fun tropical hint that didn’t annoy me. In the end, my favorite of these non-dairy chai mixes was the almond milk. Now this is only my opinion and I recognize that we all have different preferences and tastes -- I tend to prefer less sweet and more savory things. However, if I wanted to go with the easiest solution (because let’s face it…I am a working mom of young children and have little time) I would make the cream of coconut and save myself from standing over a stove for 45 minutes constantly stirring milk while it reduced. I would be curious to hear about what you think of these suggestions. Have you tried any other techniques for adding some sort of non-dairy milk or cream to your tea? 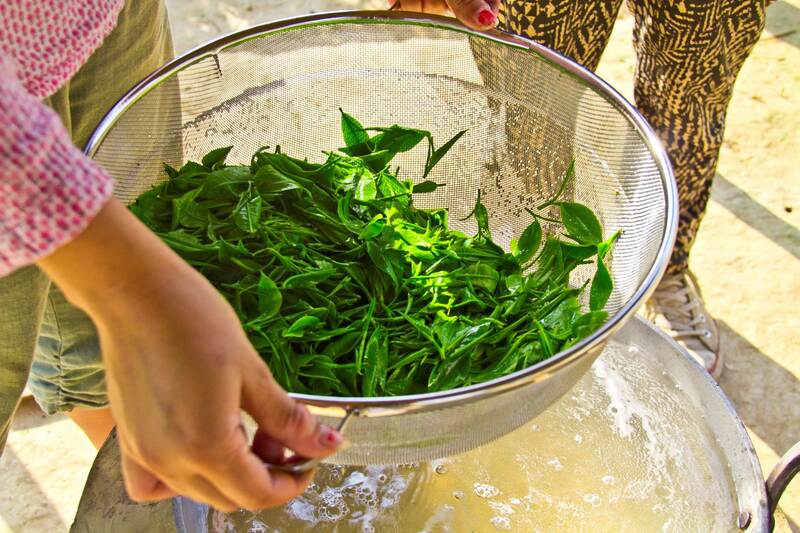 What’s your favorite way to make Chai? Tell us in the comments below! **Something else to note: Because of space and health code restrictions, TeaSource is unable to offer these non-dairy options in our stores. Bummer, I know. Mix in a saucepan and bring to a boil. Reduce heat to a simmer and cook (don’t forget to stir the pot occasionally!) until the milk has reduced to 1 cup. Remove from heat and let cool. To make Chai “Goop”: Add 1 tablespoon of TeaSource Chai Spice Mix to 1 cup of non-dairy sweetened condensed milk. 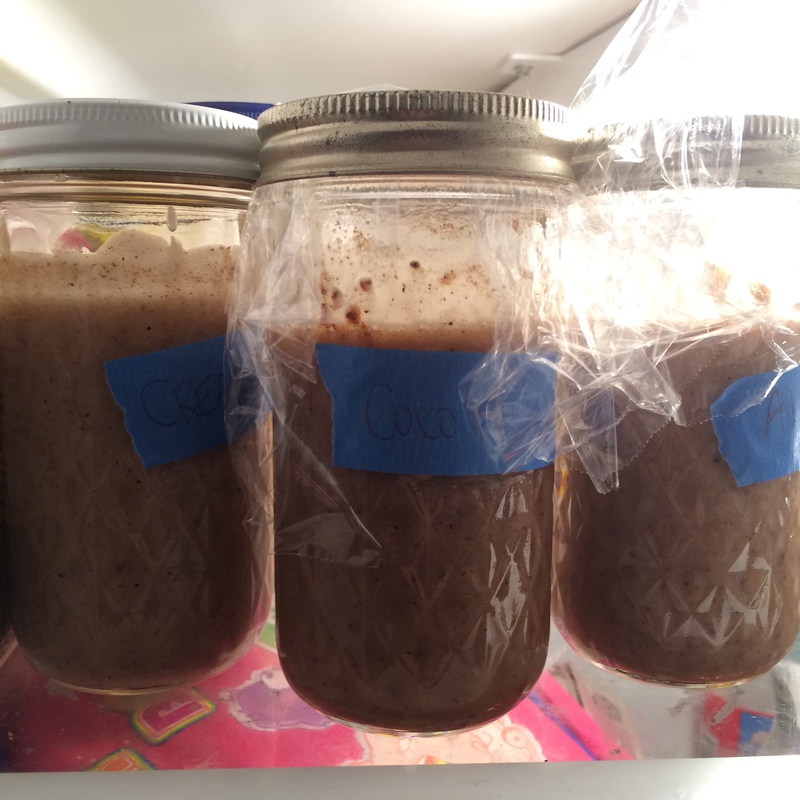 Refrigerate overnight (or 8 hours). Add “goop” (to taste) to a cup of strong black tea – we suggest Breakfast Assam. Cheers!